At the same time that Dave Matthews Band were across the Plains of Abraham playing to the masses on the main stage, Sum 41 headlined the Loto Quebec Stage. 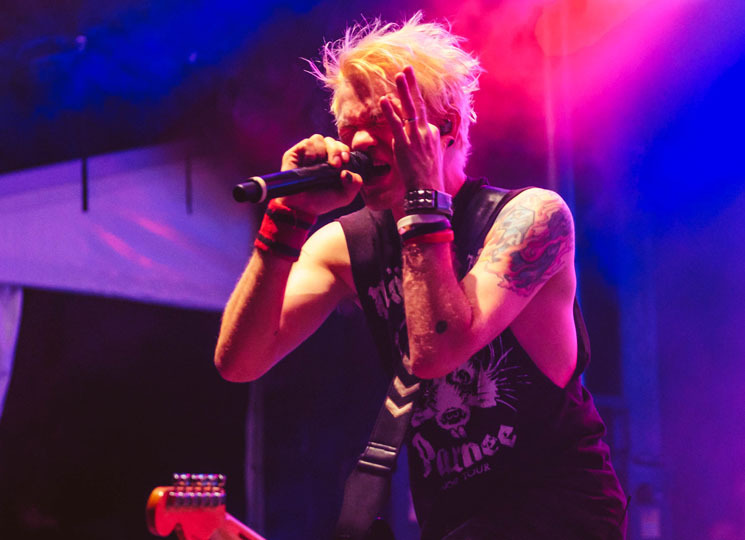 If the sea of Sum 41 shirts filling the relatively small outdoor venue wasn't enough to signal the crowd's excitement, the fact that they voluntarily sung along — out loud, in public, in 2018 — to filler music by System of a Down, Green Day and Papa Roach should give you an idea of just how enthusiastic the crowd was. A few false starts (a light here, a roadie there) didn't dampen their spirit, and when the band finally did strut onto the stage, amidst lights and smoke, the rambunctious cheers proved it. Water bottles, beer cans and crutches (really) were making their way through the sky by the start of set opener "The Hell Song." The stage was decked out in Does This Look Infected?-era green goop decals (and ex-drummer Steve Jocz's zombie-fied face from the album cover appeared on both bass drums), suggesting that Sum 41 might be extending their 15th anniversary full-album tour — especially when "Over My Head" was played second. But those hopes were dashed when frontman Deryck Whibley launched into "Fake My Own Death" from 2016's 13 Voices. "Goddamn I'm Dead Again" from that same album was next, followed by Chuck cut "Subject to Change." Whibley acknowledged the anniversary of Does This Look Infected? prior to playing "Thanks for Nothing," and the LP did heavily influence the set list, with "Spleen" and "Still Waiting" also making it in. But it was the earliest hits that got the biggest reactions — "Motivation," "Makes No Difference" and "In Too Deep" prompted the loudest sing-alongs, though the crowd didn't stay quiet during slightly later offerings like "Walking Disaster" either. Those looking for purely a nostalgia trip were instead given a show by a band that remains determined to keep moving forward — even if they haven't particularly grown up. From enlisting Tom Thacker from Gob and his fedora for the touring lineup, to referring to the audience as "motherfuckers" approximately one million times in the course of an hour-long set, to un-ironically inserting riffs from "Smoke on the Water," "Paranoid" and "We Will Rock You" into the set, Sum 41 don't seem particularly interested in being relevant. In a surprising end to the show, they reverted to juvenile jokes about dicks and old people falling on "Fat Lip," before extending a dedication of Linkin Park's "Faint" to the late Chester Bennington. That juxtaposition pretty much sums up the group at this point — awkwardly bridging the gap between the jokey pop punk band they started out as, and the darker, heavier direction they've gone in. The wildly positive response from the Quebec City audience, though, seemed to indicate that plenty of people have learned to appreciate both.